I’m now on an eleven game winning streak, this preceded by my initial six game win streak with a very similar list. I did lose a few matches in between those two hot streaks, mostly to non GX decks. I have not lost to a decklist that had a GX Pokemon as its featured Pokemon. The only match I lost with a GX Pokemon was to a really creative – and expertly played – Nihilego GX Raticate Break deck. I also have played mostly against decks using worlds format cards as well – most of my opponents are still using cards that will soon no longer be standard legal, while this decklist is 100% 2019 format legal. I might swap out the Counter Catchers for Switches, Tate and Liza, or – as inspired by one of my opponents – Warp Energy. I seem to rarely get a Tapu Koko start, and I usually have to give up an energy to get whatever is in the active out from up top. That’s why I like the idea of Warp Energy – I can attach an energy and get the Murkrow or Skitty stuck up top out of there. 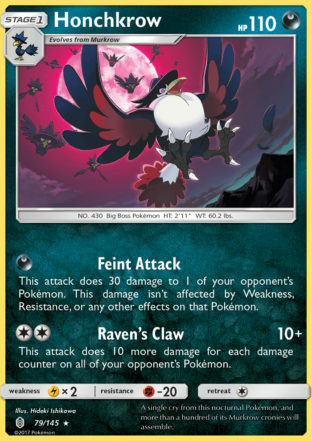 Then, later when I need an energy attached to that Pokemon, I have some flexibility in that I can attach any energy card and activate Raven’s Claw. Sometimes I actually take the lead, which means Counter Energy only serves as a single energy attachment. Having a couple of additional energy cards and a quasi Float Stone could be a definitely benefit to the deck. But we’ll see, I’ll update you on that later. So enjoy this list or MarquisEXB’s, I think either one will win you a ton of matches on the ladder… and maybe even at worlds as well! Yeah this is a good deck for this meta, and I think it’ll just get stronger when the standard changes. If I hit a losing streak, I’ll go to this deck for a quick win.